It’s hard to believe it’s our one year anniversary! A year has past since Jennifer designed and launched this blog as a commemoration to my father’s artwork. She also wanted to have it up and running prior to our first trip to Paris, February 2013. There, we attended Jeff Cody’s presentation of my father’s work, the first since our family’s escape from China to the United States in 1947. I’m not even sure where to start reviewing this momentous year. First, as I had mentioned before, there are still times I’m still getting my head wrapped around the fact that my father was so well-known in his field and that he was part of Chinese history. What surprised me the most about the presentation was the excitement our family generated, simply because we were his direct descendants. I never expected the outpouring of sentiment, of others seeing my father as a great man, or of students wanting to talk to us because he was part of their thesis research. Attendees were anxious to hear what it was like growing up with him. I must say it was rather overwhelming. This presentation led to an introduction to M. Emmanuel Breon, curator of Cite de l’architecture et du patrimoine who invited us to display his work in their October-February 2014 exhibit on Art Deco. He was labeled the Chinese architect from the Paris Expo of 1925. 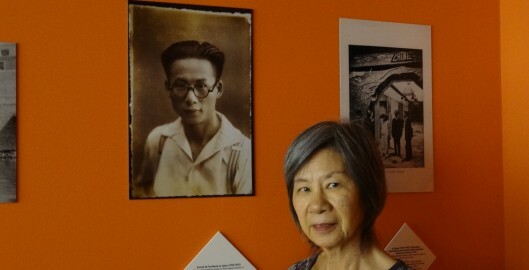 Again, we were greeted with great enthusiasm, treated like VIP’s during the Inauguration tours of the exhibit, and met the sons of my father’s French colleague who worked and lived in the French Concession in Shanghai, the same place my family and I resided. it was so exciting for us to hear that their father spoke a lot about mine, a direct contact that made the evening even more special. At a later meeting with the curator, we talked about possibilities of further work together. And, so the research to locate his work continues. In between Jeff’s presentation in February 2013 and my father’s display in October 2013, we had the opportunity to explore Paris. Meeting people at the presentation gave us access to favorite watering holes of the locals. I felt more like a Parisian than a tourist. And, locating one of places where he lived as a student and being invited upstairs by two of the tenants, strangers who are ex-pats from New York and Canada, was another special unexpected happening. I must admit that Paris is my favorite city in the world. Perhaps so, because Paris was such an intricate part of my father’s initiation and development into adulthood. It is where I feel closest to him, the part of him that I never knew. And, I thirst to know more of who he was then, before life defeated him. Paris denotes a time in his life where his star was just starting to rise. Knowing about him as a young man, full of life, pursuing what he loved best, gave me the inspiration to want to live, to fight cancer. It was almost as though he were beside me, prodding me on, “Gayook, take from what I accomplished to follow your passion, to make your mark in the world”. A year later and still cancer free, I have again started to use his gift to me through his lineage – qigong, an ancient Chinese healing art – to help others not only recover from life threatening diseases and other trauma, but to find their way to a rewarding and fulfilling life.